Recognized as one of the greatest portrait sculptors of all times, Houdon worked in the neo-classical style. In his early twenties he spent four years in Italy studying the art of the antique. Back in Paris he quickly became famous for portrait sculpture and received commissions from all over the world. His subjects ranged from the French philosophers Diderot, Voltaire and Rousseau to the American patriots Washington, Jefferson and Lafayette. These carefully crafted portraits capture not only the physiognomy but also the character of the sitters. 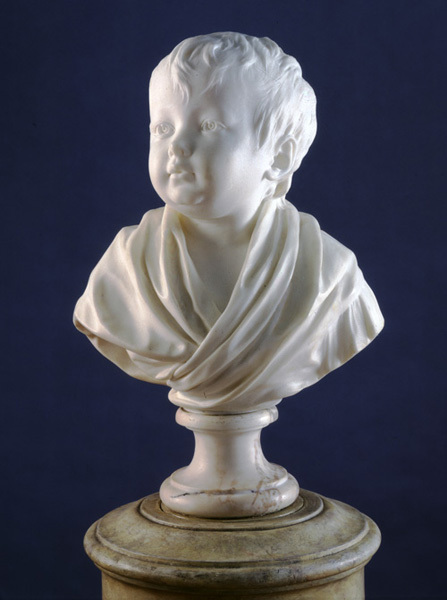 In portraits of his wife and children Houdon achieved an added measure of intimacy and warmth, as in this charming bust of his third daughter, Claudine, who was about a year old at the time.